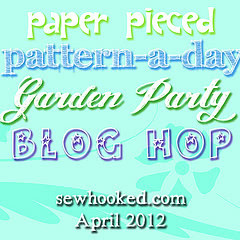 Today is my special day for Jennifer’s Garden Party Blog Hop. This month, 30 designers are creating 10″ paper pieced blocks. Links to download the free patterns are available here and you can see the blocks that have been created so far in the Flickr Group. Here’s my block: Patio Umbrella. Download it here. 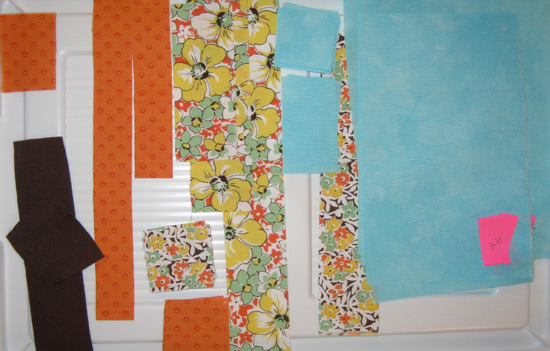 My fabrics – the flower prints are from my 1930s stash of fat quarters. The two prints are from Feedsack by Sara Morgan for Blue Hill Fabrics. 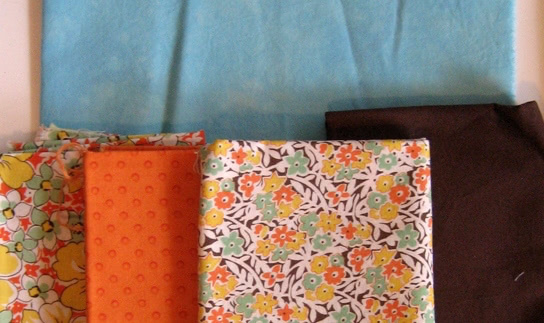 The blue sky fabric is from my hand dyes and the orange dot fabric is Arabella by Pat Sloan (I think!). 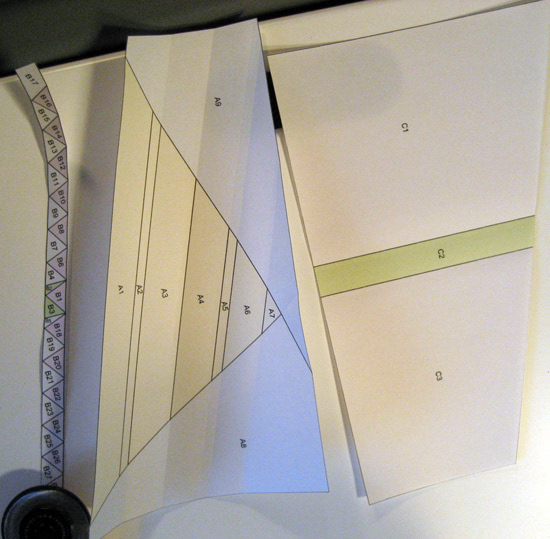 I prefer to measure my paper pieced segments, add 3/4″ for seam allowance and fudge room, and then pre-cut my fabrics into usable shapes in advance. I have included my measurements in the PDF file. This way, I have all of my pieces ready when I head to the sewing machine and I know that all of my pieces will fit the required sections. 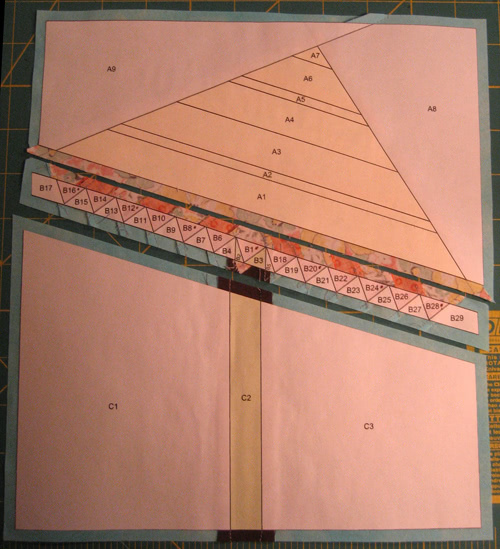 Lately, I have been doing my paper pieced projects with freezer paper following the ideas presented in this tutorial: Freezer Paper Foundation Piecing. 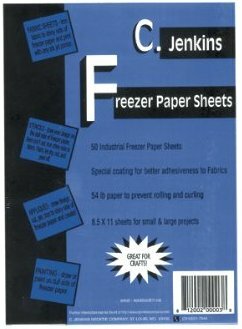 I really like the C. Jenkins Freezer Paper Sheets that I can run through my printer. While the sheets of paper are more expensive, the leftover pieces not used in the printed diagram can then be used for appliqué. When stitching the three sections together, I first joined sections B and C, being careful to match up the pole/trunk of the umbrella. 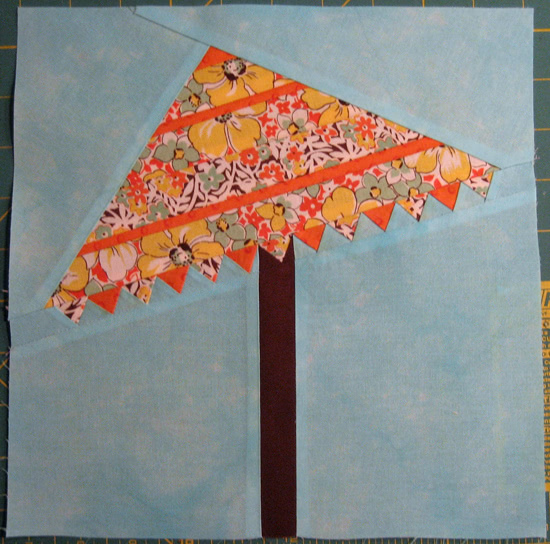 I stitched with section B on the top, so that I didn’t accidentally cut off any of the points of the umbrella. If you complete the block, be sure to upload it to the Garden Party Flickr Group as Jennifer is giving away a prize each week to one lucky quilter. Thanks so much to Jennifer for organizing this blog hop party. I have enjoyed seeing all of the blocks the talented designers have created. In this week’s Learning Center post, Pat Sloan is exploring embroidery, crazy quilting and sashiko with two talented guests. 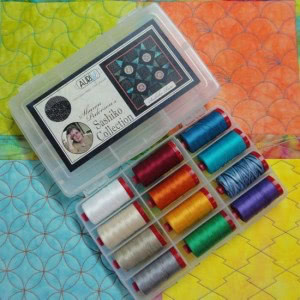 Plus, Aurifil is giving away a Sashiko thread kit to one lucky reader. Read the post and enter the give-away here! I love this block Michele! At first glance I thought the umbrella piece was one solid piece of fabric and as I read further I realized that was paper pieced too! Gorgeous! Cute block! I printed it out and there seems to be an issue w/pg. 2 & 4. On my copy the lines are all haywire. I didn’t see a link to the designer’s blog…so am posting the issue here. LOVE that you used the 30’s fabs for it. Cute! It seems to be printing out fine here. Did your paper maybe jam as it was printing? Sections A and B are skewed on the page so that it’ll print on one page for each. Can you try again please. This is so cute, I have to try it, though the tiny points are scaring me a bit. I love using freezer paper for pp, no tearing the paper off. I like that you can use them several times, if you are careful. I have always cut my own, but want to try this paper. So much easier.Thanks for the tip and the cute pattern! No jamming….just printed again and it is still all wonky. ??? The main shapes are there, in the umbrella top, for example, the lines that go across are not there and the ones that are there are creating a triangle shape to the left. Maybe I should download it again….Have not had any issues with these blocks prior to this. OK…it worked. I saved it to the computer and printed from the computer’s file. Not sure what the difference is, but glad it worked! Thanks…. What fun! I somehow missed the beginning of this hop, so today’s post was a fun revelation for me. Thanks! What a fun block. Off to see the others.